. After graduation in June 1925 he was commissioned in the Infantry and his first three years were spent at Fort Omaha and Fort Crook, Nebraska. From 1928 to 1929, he attended The Tank School at Fort Meade, Maryland. Next, he was assigned to the 31st Infantry in Manila, Philippine Islands and the 45th Infantry (Philippine Scouts) at Baguio. On June 12, 1931 Second Lieutenant Joseph P. Cleland and Florence Emily Cadotte were married in Manila, Philippine Islands. Florence was the daughter of an American father, George B. Cadotte of Michigan and a Spanish mother from Valencia, Spain, Emilia Millan. From 1932 to 1933, he attended The Infantry School and was assigned to the 29th Infantry at Fort Benning. In 1936, he returned to Kemper as Professor of Military Science and Tactics. From 1938 to 1939, he attended Command and General Staff College at Fort Leavenworth. Next, he was assigned command of Headquarters Company, 33d Infantry in Panama. Later he was G3 of the Panama Mobile Force.
. He was recognized with the award of the Soldier’s Medal after swimming out to rescue a downed aviator in the sea near Bougainville. In November 1943, he became Chief of Staff, 43d Infantry Division, at Munda. With that division he participated in the New Georgia, New Guinea and Luzon campaigns. In April 1944, he was given command of the 103d Infantry Regiment. On January 9, 1945, he commanded one of four regiments landing abreast on Luzon from Lingayun Gulf. After capturing the town of San Fabian the 103d Infantry drove inland and seized the Ipo Dam, which was a vital part of the Manila water supply system. For his conspicuous and gallant leadership, he was promoted on the battlefield to brigadier general. For his personal heroism in seizing and holding the key bridge at Lubao, he was awarded the Silver Star. He was part of a small group that captured the bridge at Lubao, which was mined for demolition before it could be destroyed. He and his force were cut off and had to fight to hold the bridge until help arrived . As the 43d Division prepared for the invasion of Japan, the war ended. As Assistant Division Commander, he headed the Advance Headquarters in Japan to secure an area for the division near Tokyo. In the fall 1945, he accompanied the division home for demobilization and in January 1946 was ordered to Chile as Military Attaché. In October 1947, now demoted to colonel, he was ordered to Fort Leavenworth for a faculty position with the Command and General Staff College. In April 1950, he volunteered for Airborne and after completing Jump School at Fort Benning, commanded the 504th Airborne Infantry at Fort Bragg for a year. In September 1951, after activating the 508th Airborne Regimental Combat Team and moving it to Fort Benning, he was promoted to brigadier general, as Assistant Division Commander of the 82d Airborne Division. On June 3, 1952, he assumed command of the 40th Infantry (National Guard) Division in Korea and pinned on the second star of a major general. After Korea, he was Commanding General, 1st Cavalry Division in Hokkaido, Japan. Then he was assigned to command the XVIII Airborne Corps at Fort Bragg for his third tour there. He retired after 30 years’ service. After retirement he and his wife developed the 500 acre Lone Pine Farm which they owned with two of his sisters and their husbands. In 1956, they traveled in South America. In 1957, he returned to Kemper Military School and College, for two years, to convert the 113 year old private institute into a nonprofit organization. For his effective promotion of the military-academic type of education, he was awarded the honorary degree of Doctor of Laws by Norwich University. In 1964, the Clelands were invited to rededicate a school he and his division had built in Kapyung, Korea. Francis Cardinal Spellman had sent him the Maltese Cross upon his retirement as a token of appreciation for what he had done for the orphans of Korea. In 1969, he developed acute glaucoma and was hospitalized at Torrejon Air Force Base [Spain]. After five operations he lost his left eye. They sold the farm and wintered in Florida. In October 1972 he had a severe congestive heart attack. They bought a condo in the same building as Florence’s sister in Bellair, Florida where they moved in June 1974. In July 1974 they flew to Madrid where he had his first stroke. He was hospitalized in Torrejon and after two months they returned to Bellair. He died on March 28, 1975 after further strokes and pneumonia. 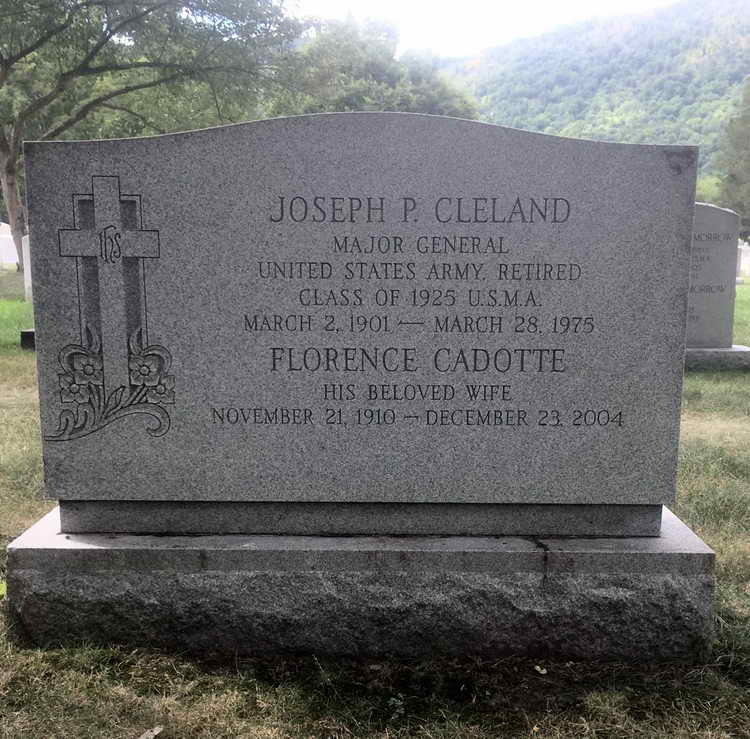 Grave marker for MG Joseph P. Cleland and spouse in Section XVIII, Row C, Site 20, United States Military Academy Post Cemetery, West Point (Orange county), New York. Colonel Cleland was in command of the 508th ARCT when it was reactivated at Fort Bragg, NC on 5 May 1951.